The natural skincare journey didn’t stop at just one brand despite my love for it. I came across Skinvestigate, a website that offers accessible and affordable natural organic skincare. After browsing through, I picked out 4 products to try and review! This nutrient rich cleansing milk gently cleans skin and removes make-up to leave it soft and comforted. Caring Sweet Almond Oil melts dirt, as Glycerin purifies and Aloe Vera hydrates. Made with 91% organic ingredients and certified to the strict organic skin care standards. Ingredients of the product here. Cleansing milks are my favorite when it comes to removing light makeup and cleansing the skin in the most gentle way without over-stripping the skin of its lipids. It is advised to massage the skin in circular movements for a few minutes so that the product can help to dislodge dirt and detoxify, while conditioning skin. The creamy milk is a tad greasier than the one I usually use but it removes my normal light powder and eyeliner fine. Times when I feel that my skin is still clogged with dirt, I double cleanse with the cleanser below. Plant derived cleansers gently clean skin, as softening coconut extract and anti-oxidant green tea condition. Made with 74% organic ingredients. All the ingredients include some of the greatest that nature has to offer natural beauty and all meeting organic face certification standards. This organic face wash is perfect for those that like a thorough-cleansed skin. It has been such a long time since I use a cleanser that foams! The foaming is not heavy – which is expected since the foaming are usually caused by chemicals. I like how the cleanser makes my skin feel. Clean, but not dry out. Restore skin with this potent blend of antioxidant rich Argan and rejuvenating Shea Butter, while Cocoa Butter hydrates and Jojoba protects. Made with 90% organic ingredients with a delicate floral organic scent. Extremely hydrating and works well for flaky skin. I broke out a little during the first week of use, probably due to its rich ingredients and my insufficient lipids in the skin. I used this after cleansing and my skincare routine was cut short to just 2-3 products each day. An easily-absorbed certified organic hand cream that leaves hands moisturised, protected and cared for. This special blend of plant oils fight dryness as Shea and Cocoa Butter restore skin. Made with 87% organic ingredients. This hand cream works great for my wrinkled hands that have been washed too many times a day. Sometimes I look at my hand and think they belong to a 50 year old woman. I cleansed and moisturized with the hand cream on my left hand. Check out the difference! No more excuses not to moisturize, do I? 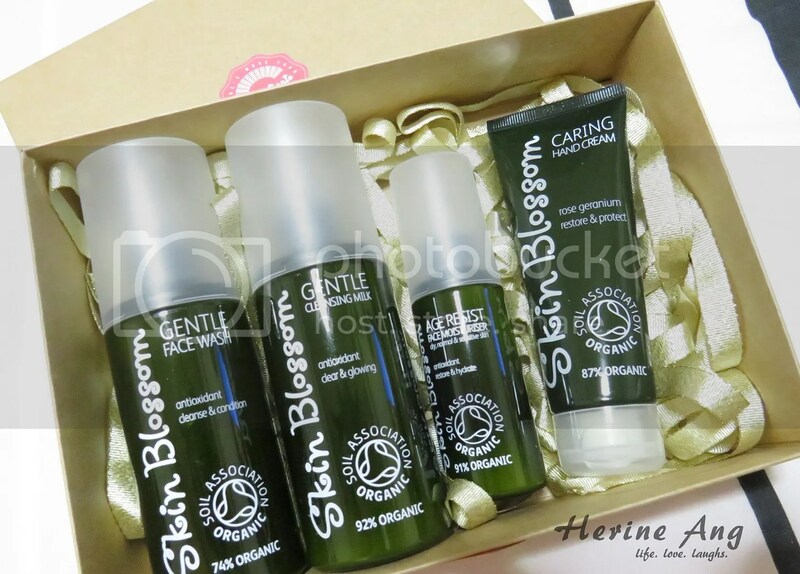 Overall, I think Skinvestigate offers good skincare products that are very value for money! I will highly recommend to people who wants to make natural product a staple of their skincare regime without burning a hole in their pockets. Enter the promo code “HERINENATURAL” at checkout to enjoy a 15% discount of all orders for now till end Nov 2016!